Emergency crews in Ukraine are trying to stop a massive forest fire from spreading towards the abandoned Chernobyl nuclear power plant. Prime Minister Arseniy Yatesenyuk has flown over the area in the north of the country. There was a warning that high winds were blowing the flames towards Chernobyl where, 29 years ago this week, a reactor fire led to the world’s worst nuclear disaster. A 30 kilometre exclusion zone remains in place around the plant, which is still contaminated by radioactive particles. “Our state emergency services are actively trying to localise the fires. Three planes, one helicopter and several vehicles have been deployed. A lot of resources are being used to prevent the fires from spreading,” said Yatsenyuk. 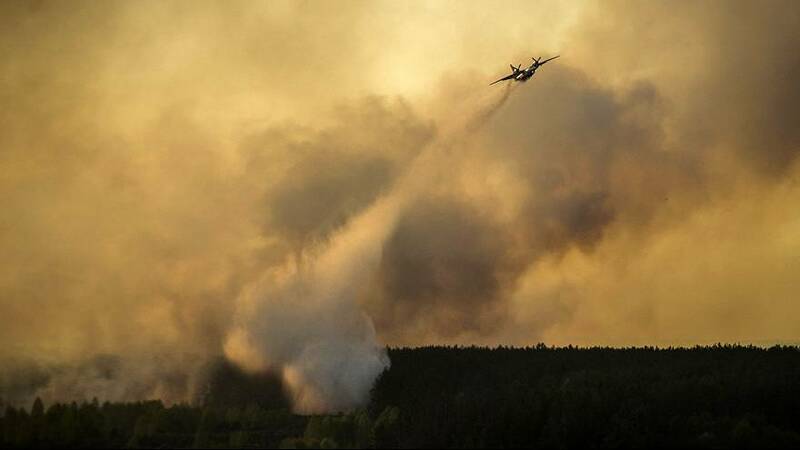 The fire is described as the largest of its kind to hit Ukraine in more than two decades. In February, international experts warned that a large amount of dangerous isotopes remained in the forests near Chernobyl, which could be spread by forest fires. Chernobyl’s Reactor 4, the epicentre of the 1986 blast, has been encased in concrete. Chernobyl Children: what makes Ukrainians born in 1986 different?